"Space Age" fiber fishing line from Izorline - The originators of Spectra fiber fishing line!!! NOTE: * Special order/call for availability fiber requires precise and very specialized braiding techniques. Accept no copies or imitations!!! 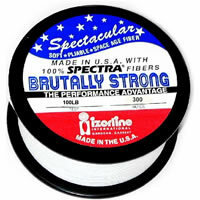 Izorline "Brutally Strong" Spectra has been field tested under extreme conditions longer than any other braid!! !